A six-hour course for using mindfulness practice to transform anxiety, anger, and despair. 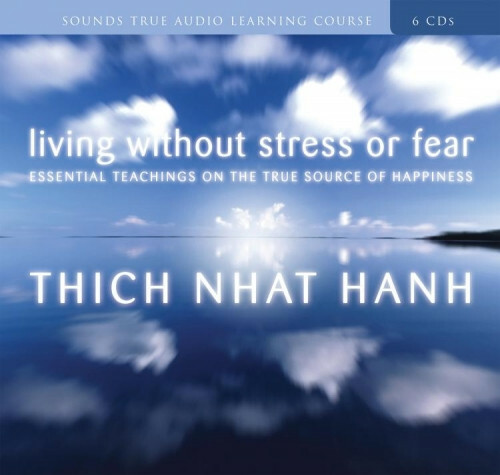 A life without stress or fear may seem like an impossible dream—yet Thich Nhat Hanh has spent a lifetime proving that it is not only possible, it is also within our grasp. On Living Without Stress or Fear, this treasured Zen master shares a message of hope: that we can, through the practice of mindfulness, find freedom from the grip of emotions like anxiety, anger, and despair. We do not find happiness by suppressing emotions like stress or fear. As Thich Nhat Hanh teaches, you can develop a capacity to deal with such emotions by building a sanctuary—your “true home”—in the present moment. Through techniques such as “mindful breathing” and the “begin anew” practice, you purposefully expand your ability to dwell in a state of peaceful clarity, and develop the insight to see through to the underlying causes of negative emotions. By facing your inner darkness with awakened compassion, you can transform toxic energies within you—and radiate the energy of lovingkindness to everyone around you. Thich Nhat Hanh has lived and taught the path of peace in the most challenging situations—carrying the light of compassion into places stricken by war, famine, and despair. Refined throughout a lifetime of mindfulness in action, he now shares his most transformative teachings and practices to guide you in your own journey to the source of happiness on Living Without Stress or Fear. Thich Nhat Hanh is a Zen master in the Vietnamese tradition, scholar, poet, and peace activist who was nominated for the 1967 Nobel Peace Prize by Martin Luther King, Jr. He is the author of more than 40 books in English, including Peace Is Every Step and Living Buddha, Living Christ. Buy "The Present Moment" instead of this book. He presents the exact same information (breaking down emotions like an orange and various stories. I have many S.T. Titles but was very disappointed that this is the same content as another title. Plus "The Present Moment" is a better recording and he speaks much more clearly. I have been very pleased with my purchase and am very glad to have found your website. I will be ordering more items soon.